On Saturday, April 23, BPFNA Executive Director LeDayne McLeese Polaski and former Board Member Chakravarthy Zadda led a Conflict Transformation training for the Asian Church leaders of ABC Metro Chicago. The training was sponsored by BPFNA ~ Bautistas por la Paz and hosted at North Shore Baptist Church. One of the excitements and joys and terrors (!) of leading trainings is that you NEVER really know what’s going to happen. Jimmy Carter was president of the United States. Jimmy Carter has built Habitat for Humanity dwellings for 33 years. Jimmy Carter led the Carter Center in eradicating much of the Guinea worm plague in West Africa. Jimmy Carter is a (mostly) unashamed Baptist. Jimmy Carter teaches Sunday school at the Maranatha Baptist Church in Plains, Ga. Jimmy Carter has cancer. Yet in announcing that he had contracted that dire emblem of mortality, and that it had spread throughout his body, the 90-year-old insisted that he would only “adjust” his schedule accordingly. An adjusted schedule is the most accommodation cancer is going to get from Jimmy Carter. WELCOME MINISTRY presents STREET REQUIEM – for those who have died on the street. Twice in the last three years I have made a pilgrimage to Overland Park, Kansas, for the biennial Mission Summit of the American Baptist Churches in the USA. These trips have been particularly evocative not only because Kansas is my birthplace but also because my earliest memories come from that part of the world. Overland Park is a suburb of Kansas City, Kansas, where our family lived from 1950 to 1953. For me, that period spanned ages three to six. As I have mentioned before, during those years my father was the founding pastor of Prairie Baptist Church in Prairie Village, the suburb next to Overland Park. In that time of the post-war boom in the church, American Baptists had a program called “Churches for New Frontiers,” in which they purchased land and planted churches in promising suburbs. My father, following a missionary yen, left a church of 1000 members to pastor a congregation of 13, which met in someone’s living room where the pulpit was the top of a new-fangled television set. At least this is the story I’ve been told. The vivid memory I do have from that time is of my father, wearing work clothes and his grey fedora, helping to roof the first building on the lot at 75th and Roe. That building was eventually the parsonage, but in the beginning it served as the church building. Upstairs was left open as a single large room which served as the sanctuary and the rooms in the lower level functioned as classrooms. I don’t know how much of that building beyond the roof was the work of parishioners, but I’m certain someone laid a strong foundation there. I don’t mean only the foundation of the physical plant. After 65 years, that little house is long gone, but Prairie Baptist Church seems to be going strong. I also can’t tell you the full extent of my father’s evangelistic passion that led him to leave a large congregation for one that didn’t even exist when he signed on. It must have been some of that same passion that led Paul to travel all around the Mediterranean carrying the gospel to the Gentiles and planting churches all along the way. Part of the story of my father’s missionary journey across Kansas was that, in spite of low pay and a growing family (my younger sister, the last of four siblings was born in 1951,) he stayed long enough to lead the congregation through its first crisis. He helped the congregation through the tension that arises when a second wave of members arrive, challenging the comfort and control of the charter members. I believe my father, like Paul, was a “master builder” who laid a strong foundation and the congregation weathered the challenge and grew and prospered. 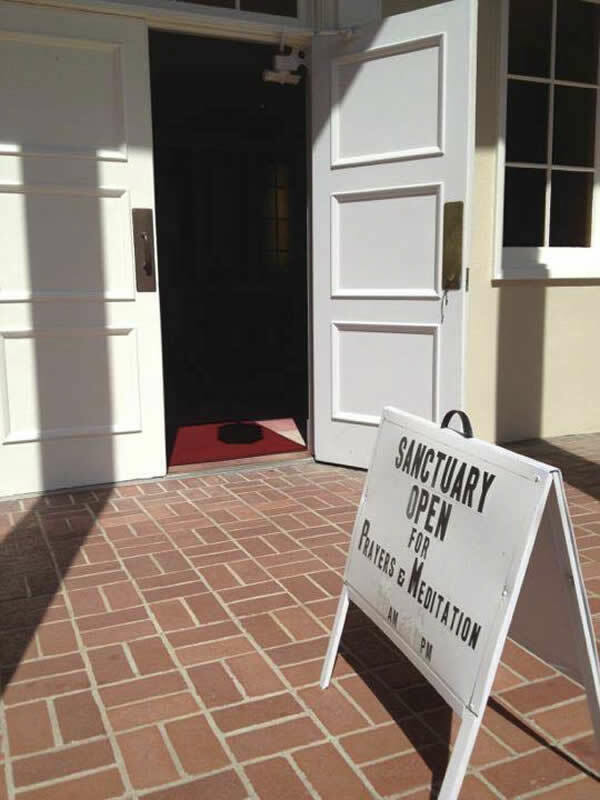 People in Palo Alto also laid a strong foundation for this congregation now in its 122nd year. We have a long and rich history of faithful witness and service. But, as we face an unknown, uncertain future, I wonder what it is that constitutes a strong foundation for a church. In the hymn we just sang Rod Romney wrote that the “The church’s strong foundation is God’s eternal love…” Does that sound right to you? Is that the rock on which our church is founded, the pillars sunk deep in the soil that lift our spire towards heaven, the grounding from which our ministry rises and shines? Is it a foundation on which we can continue to build? We know that Paul was dealing with a contentious congregation in Corinth. He believed he had laid a strong foundation – the one foundation of Jesus Christ, the sure foundation of the empowering Holy Spirit, the strong foundation of God’s eternal love. But he was worried about what was being built on that foundation. He was afraid that false prophets, bad teachers, and self-centered preachers were leading the people astray and creating chaos in the congregation. I suppose my father must have worried that the charter members of Prairie Baptist Church would not be hospitable to new folk, would not offer a warm welcome to strangers so that the message of God’s eternal love would distort and die from inbreeding. In conclusion, she wonders, “When will we have the courage to boldly embrace this kind of change, to encounter the new opportunities that come as possibilities and opportunities instead of problems? Change is hard. This is a true statement. But change comes, whether we want it or not. The Spirit of God is always creating new possibilities where we prefer to endow old institutions. Will we have the courage to embrace this change? Or will we keep searching the aisles, hoping to replace what we had?” (Amy Butler, “Choosing Adaptive Change,” 8-11-2015, baptistnews.com). The strong foundation is laid, foundation of God’s eternal love. The question is what will we build on it moving forward? Paul says we might resort to “gold, silver, precious stones, wood, hay, straw.” But we know that, literally, wood is the only one of those resources with which we might build a building. Paul is more concerned with the qualities that characterize a congregation than he is with building a church building. He is wants us to consider when the refiner’s fire is lit, what will be destroyed and what will be purified? Remember the three little pigs? Neither the house of straw nor the house of twigs survived the wolf’s bad breath. Only the sturdy brick structure built on a strong foundation withstood the horrible huffing and puffing. We have been given this strong foundation of God’s love for us and all creation, a foundation that can withstand any evil powers that threaten to disrupt us and consume us. What will we build on it? I don’t mean to be a prophet of gloom, but the good news is being undermined, distorted and destroyed by the false prophets, bad teachers and self-centered preachers of our own time and place. The threatening powers are not just individual, they are also structural and systemic. Some of the biggest challenges to the church are embedded deep in our traditions and too often operate outside our consciousness – like racism, classism, sexism, power and privilege. As Amy reminds us change is hard. Brian McLaren writes that “Jesus promised his followers three things. First, their lives would not be easy. Second, they would never be alone. Third, in the end all will be well.” “But,” he continues, “all is not well now, and that raises the question of how…how does God get us from here to there? How does God put things right?” (Brian D. McLaren, We Make the Road by Walking, p. 245). In this chapter on the “Spirit of Holiness,” McLaren focuses on God’s judgment, which, at first, struck me as a curious emphasis. As I imagine some of you do, when I hear the word “judgment” I think of “hellfire and brimstone.” We were raised to believe in a literal separation of the “sheep and goats.” It was better to be scared into heaven than to burn in hell. It was a terrible legacy that led us far from any strong foundation based on God’s eternal love. For me, anyway, the notion of eternal punishment simply will not reconcile with a God who is love and eternally loves by definition. McLaren’s argument sounds to me something like the parent who expects the best of us because she loves us so. In his view, this a God of restorative justice not a God of vengeful retribution. The place of judgment is to make things right, to restore the blessed order of creation, to build the Beloved Community on the strong foundation of God’s eternal love. The call to be the best self, the best community that we can be is a call to fulfill God’s vision for us from the beginning of time. Paul says we – you and I collectively, the church of Jesus Christ – we are “God’s temple and that God’s Spirit dwells in” us. To live into that reality is not an easy thing. To establish God’s temple in the here and now, to be God’s dwelling place will constantly shape and re-shape our witness. It is inherently counter-cultural, not easy but worthwhile work. If we trust that we are never alone in the work, we can also trust that in the end all will be well. In our words of preparation, McLaren writes, “If we believe in judgment [as] God’s great ‘setting things right,’ we won’t live in fear. We’ll keep standing strong with a steadfast, immovable determination, and we’ll keep excelling in God’s good work in our world. If we believe the universe moves toward purification, justice and peace, we’ll keep seeking to be pure, just and peaceable now. If we believe God is pure light and goodness, we’ll keep moving toward light each day in this life. Then, someday, when our time comes to close our eyes, we will trust ourselves to the loving Light in which we will awaken, purified, beloved, forever” (McLaren, op. cit., pp. 247-248). A strong foundation is laid. “Each builder must choose with care how to build on it.” Let the church continue to be built and re-built on God’s eternal love. Amen.